Just after first break today we packed up the tools and switched to get ready for workshop mode. The shop was tidied and swept, benches cleared, tables and chairs were brought out from storage and the setup began. 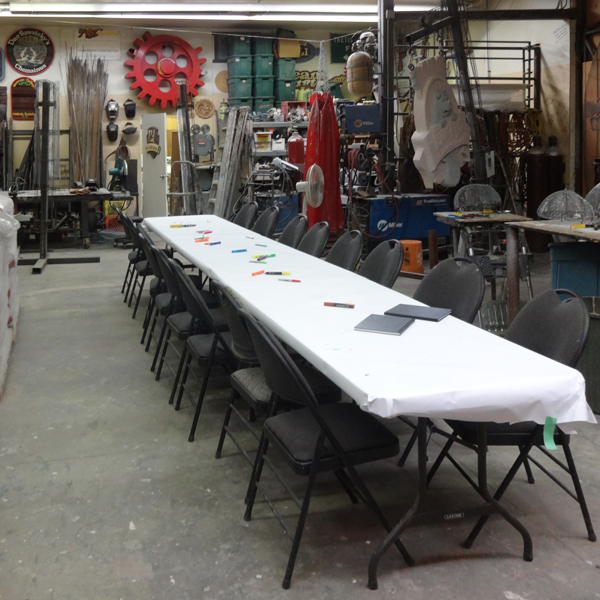 In less than two hours the shop was transformed into a classroom one one more time, in readiness for our guests to arrive. Our Sign Magic Workshop group was travelling from far and wide including, New Brunswick, Ohio, Utah, Colorado, Oregon and Australia. The group this time is small with some last minute cancellations but as enthusiastic as ever. This afternoon the cameras were clicking, and the questions were many which we happily answered. Officially it doesn’t begin until tomorrow morning at eight o’clock but the learning has already begun. Tomorrow morning I be out to the shop bright and early. It’s my bet most will be waiting by the door when I put in the key. I’m looking forward to another wonderful Sign Magic Workshop.